Sarbaharapath | Statement of CPMLM-BD, 1 May 2013: Keep in Memory The Rana Plaza Garment Massacre. Never forget Class Struggle! 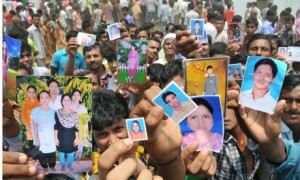 Statement of CPMLM-BD, 1 May 2013: Keep in Memory The Rana Plaza Garment Massacre. Never forget Class Struggle! The whole nation and people are speechless. There is no language to express this grief. Thousands of our class brothers and sisters have been buried under the collapsed multi storied building of garment factories, the prison of profit and greed of 21st century decadent capitalism. No one knows how many thousand workers are killed, how many thousands are crippled and how many thousands are disappeared by the owner, government authority and hospital. This is the largest genocide in the contemporary history. The proletarian people being pauperized with the exploitation of class enemy come from village to cities to be scarified victim of capitalist profit. At the time when the bourgeoisie and feudal, with the greed for power, have spoilt the environment of the country through government-non government Mullah-semi Mullah anti woman anti workers filthy evil politics, the owner of the building and garments forced workers to enter the collapsing building to work so that their foreign masters do not cancel shipment. Keep the horrendous genocide in memory! No more scarifying victim of exploitation! Let us break the chain! Martyr comrade Siraj Sikder taught us to take communist ideology and build people’s war against exploiting class .Never forget that. Without war we are helpless.